The year is 2185. The human race has gone to the stars, and found that they’re not alone. Local space is teeming with civilizations, some hostile, some friendly, and some indifferent. This is the universe of Ephemeris. Ephemeris is a game of galactic trade and galactic conquest; of inter-species conflict and cooperation. 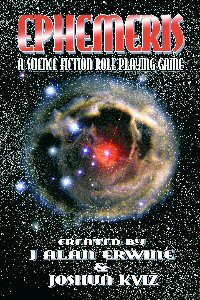 Ephemeris is a science fiction role playing game. Here you will be able to take on the role of your favorite alien species and your favorite class. You will be able to trade, fight, negotiate, conquer, whatever you’d like to do with your fellow players. You can play the role of an Althani Trader, or maybe an Arbonix Cyber Wizard, or maybe even a Human Nanist. You can create a party made up entirely of one species and set out to upset the trade routes of a rival species. Or maybe you want to create a party with a variety of races that preys upon the trading routes of the various civilizations. Or maybe you want to explore the ancient ruins on long dead planets, ruins that clearly show that there were other species roaming the spaceways in the past…but where are they now? You can fight in great wars, negotiate grand peace treaties, and explore sections of the galaxy that no sentient has ever explored. Or maybe your party has joined with one of the interplanetary corporations; corporations whose motives are never entirely clear. These are just some of the possibilities open to you. The universe of Ephemeris is yours to do with as you please. What you now hold in your hands are the basic guidelines for the games. Here you’ll find the races, classes, abilities, skills, weapons, and ships that allow you to create your own Ephemeris universe.